Thank you for choosing my house - It sits on the ocean so you never have to drag your things in a car or deal with parking. Polly's Folly has a modern, casual beach vibe built for families and friends who are ready to lounge in the surf by day and linger on the decks at night. It's also a quick drive to Charleston, which is a completely different, must-see experience for those who like to pack it all into a day. Folly Beach also has many great restaurants, and hang outs for those who want the ability to walk home. I have six bedrooms, four baths, and a loft with two built in daybeds. Charleston Design maven Angie Hranowsky updated the kitchen and living areas to be fresh and relaxed for beach living. My house sleeps 14. Four of the bedrooms overlook the Atlantic Ocean with gorgeous views of the sunrise and spectacular starry nights over the rolling ocean waves. You never have to drag your things to the beach because we are on the beach. The view is like being on a boat at high tide. If you like sitting in a rocking chair, surfing, kayaking, biking, building sand castles or just watching the waves roll in with your family and friends then this is the place for you. This is an unpretentious beach cottage built for lazy days and hanging out. Folly Beach has a great selection of restaurants and bars just .8 mi from my house on Center Street. Bike and walk on the beach to the pier and county park. Sunrise is exhilirating at Folly. Wake up feeling more refreshed with the expansive views of the sky and oceanfront, try to greet the sun as the moon and stars fade away. It's a lovely time of day. My house has everything you need to dine in with a large crew. Six bedrooms and four baths. Two living areas, three tv's. Five queen beds, two twins, plus two built in twin day beds in the aerie loft. Wireless internet. The screened porch and deck overlook the ocean on a sandy beach. Restaurants are within walking distance. The decor is happy, laid back, and fun like Folly Beach. My address is 817 West Ashley Avenue. It is .8mi from Center Street. The layout is four bedrooms downstairs flanking the kitchen/dining/living area with jack and jill baths in between the oceanfront and street side bedrooms. Upstairs is a loft with two built in day beds. There are two bedrooms flanking each end of the loft with two baths just outside of the bedrooms. There are five bedrooms with Queen beds, and one bedroom with two twin beds, plus the loft with two built in day beds. Four bedrooms are downstiars,- two on each side of the house. Upstairs has two private bedrooms at both ends of the loft. The two upstairs bathrooms are outside of each bedroom door and accessible from the loft. This is a non-smoking property. No pets allowed. No house parties without prior written consent of the owner. The house is directly on the ocean. One bedroom has a sliding glass door leading to the deck. The twin bedroom is on the street side. Four bedrooms have ocean front views. Bed linens and bath sheets are provided for fourteen guests. Beach towels are not provided. There are three tvs in the house. One in the living area, one in the loft, and one in the downstairs bedroom with the sliding door to the beach. The kitchen is fully equipped with plenty of cooking utensils, dishes, and serving platters. Outside is a gas grille. There are several rocking chairs, adirondack chairs, and lounge chairs on the deck and screened porch. Under the house is an area outfitted with two picnic tables and a hammock. There is an outdoor shower on the deck as you leave the beach, and an outdoor shower under the house. Check in is 4 pm. Check out is 10 am. The house is so close to the water that at high tide it looks like you are riding the waves on a boat. The Folly Beach Marina is down ninth street, and a quick stroll from my house. It's a perfect place to drop in with kayaks and paddle boards. The house is built on 15 foot pilings which create a perfect covered area for grilling on sunny days, and in the rain. We live in Charleston and Swarthmore, Pa.
We love the relaxed nature of Folly. Basically, we love the beach and really wanted a home on the water. The hassle of finding a parking space and dragging beach gear back and forth is eliminated when you can walk out the door and be on the sand with the convenience of an outdoor shower whenever you want. We also happen to love Charleston, which provides a quick change of scenery with alot of fabulous dining options. Folly keeps getting better all of the time, with great dining, bars, and outdoor adventure experiences. Everything is walking distance from my house while giving you the peace and quiet away from the jamming town. How can you beat being on the water with plenty of outdoor spaces to hang out? We ride bikes on the beach, grill on the deck, fish, go crabbing, surf, spend time with friends and family. Oyster roasts are great under the house. Start your morning with a cup of joe at The Lost Dog Cafe- it's my morning ritual. Rita's, Planet Follywood, the Irish Pub, The Surf Bar and Taco Boy are great restaurants and very close. Woody's delivers delicious wood fired pizza and Dolphin deli delivers great sandwiches. There is a small grocery on the island called Bert's where you can find pints of Ben and Jerry's ice cream,etc. Get an ice cream at Tides Hotel and eat it by the pool. Charleston is only 20 minutes away so it is very convenient to go to the city for a completely different experience. Beach front and ocean front. My house sits on the sand, watch the sunrise over the waves from bed. It's relaxing, here! There's no need to drag your things to the beach, just walk out to the deck. Bed linens are provided for all beds. Bath towels are provided for 14 guests. Beach towels are not provided. Two living areas- the loft and main area downstairs. Ready to feed a crowd! The counter has four barstools, the table seats 10 plus I have a highchair. My deck leads straight out to the beach. There is an outdoor shower on the walkway which leadis down the steps to the ocean. My house is on pilings so guests must walk up steps to access the front door. If someone can pull themselves up stairs, then it is easy to get around downstairs. Come hang out with family and friends at Polly's Folly. We are .8 mi from the Center of town. You can rent bikes, golf carts, paddleboards, and kayaks. We have two living areas, and plenty of outdoor space in the shade and the sun. Unlike other homes, we have outdoor furniture galore. It's wonderful here! I know good babysitters and chefs!!! You can do paddle board yoga near Morris Island Lighthouse. Great house. Looks even better in person than in the photos! We’re hoping to go back! Thank you, I’ll be updating the photos next week! Keep in touch & bring your friends back to my house. Location is perfect. House has all you need and was very clean. Property was amazing and homeowner was easy to contact. Check in and out was simple. House has the best views, it’s a real dream vacation. 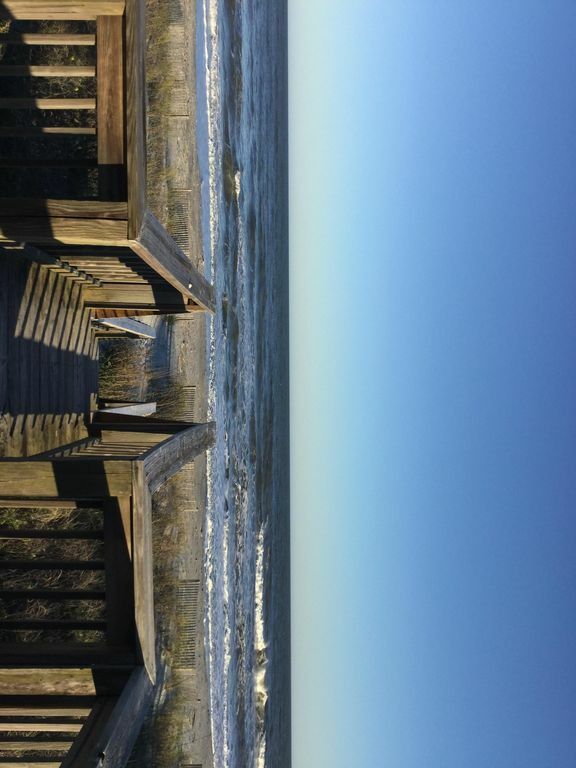 We loved our stay at Polly's Folly Ocean Front Beach House! The house was very accommodating to our group of 14, with plenty of space for us to spread out and come together. The back porch is great, and bedrooms are super comfortable. Steps away from the beach and only a mile from Folly's restaurants, bars and shops. Thank you for coming to my house. The deckand porch were redone so it’s better. Please tell all of your friends to come back to your newly discovered beach house. Polly is wonderful as was the space! She really has a casual feel to the house yet eclectic! Fun! Went with girlfriends and feel it met our expectations perfectly! She is very accommodating and felt we were taken care of from day one when I booked! It's a special house on the water and the views are spectacular! Thankyou Polly! We stayed at Polly’s Folly while we were in town for my daughters wedding. The house is right on the beach. Wish we could have used the beach more, but the weather turned cool for our weekend. That’s ok, can’t control the weather! The house was CLEAN AND SPOTLESS. The bedrooms and bathroom set up is very convenient for a big crowd. We had 13 people in our group. I would definitely stay here again should I ever need to accomodate so many people. Linda E.
Oh my goodness, All good things must come to a end. I can't begin to Thank-you enough for a wonderful long weekend. Our family of 14 had a fantastic time at your place. Priceless memories were made. We will return. Folly Beach is 17 minutes by car from Charleston, SC. The beauty of being at the beach is that you can relax by the water and go in to the city with very little effort. Charleston is rich in beauty and history, Folly is lovely and laid back. My new favorite is to go paddle boarding near Morris Island Light house. Two Historic Plantations are on HWY 61: Magnolia, and Middleton Place. The Battery has gorgeous antebellum mansions overlooking Fort Sumter. Charleston is a city of culinary delights, the food is exquisite and beautful. Don't miss the Charleston Riverdogs playing minor league ball in season. Go to Bowen's Island for oysters and live music. Every morning, when I am at the beach house, I go to Lost Dog Cafe at Second Street and Huron for the best coffees. Nightly rentals are available from Labor Day through Memorial Day. There is a two night minimum. No underage ( or high school) parties. This is a pet free, non smoking home.